Napolitano says public should be "asset in our nation's collective security"
NEW YORK (CNN) -- Almost eight years after the September 11 attacks, the American public remains insufficiently engaged in the fight against terrorism, the nation's homeland security chief warned Wednesday. 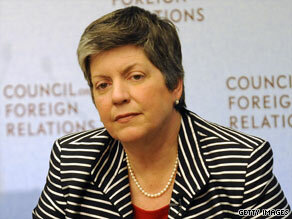 Homeland Security Secretary Janet Napolitano speaks at the Council on Foreign Relations on Wednesday. The federal government also needs to do a better job sharing information with international, state and local partners, she added. We need to make sure "as a country, as a nation, we are at the point where we are at a constant state of preparedness and not a state of fear," Homeland Security Secretary Janet Napolitano said. "The challenge is not just using federal power to protect the country but also enlisting a much broader societal response to the threats that terrorism poses." We live in a world where "the tools for creating violence and chaos are as easy to find as the tools for buying music online or restocking an inventory," Napolitano told an audience at the Council on Foreign Relations. "If 9/11 happened in a Web 1.0 world, terrorists are certainly in a Web 2.0 world now," she said, a reference to the state of development of the Internet. "The terror threat to the homeland is persistent and evolving." Napolitano outlined a multi-tiered administration homeland defense strategy based on greater interaction between the private sector, local law enforcement, federal authorities and international allies. She also promised that the Homeland Security Department would continue to encourage new thinking in the war on terror, noting that the department had recently hired a "prominent" former computer hacker to help authorities better identify weaknesses in the country's cybernetwork. In a swipe at previous administrations, Napolitano criticized the federal government for failing to do more to engage and educate the general public. "For too long, we've treated the public as a liability to be protected rather than an asset in our nation's collective security," she said. "Let me stress, this is no small matter. This is a first-order issue for us. The consequences of living in a state of fear rather than a state of preparedness are enormous. We may be better prepared as a nation than we were on 9/11, but we are nowhere near as prepared as we need to be." In highlighting the importance of greater public awareness, Napolitano noted that much of the information used by federal authorities to prevent terrorist plots comes from alert private citizens. She specifically cited the example of a botched 2007 plot to kill soldiers at a U.S. Army base in Fort Dix, New Jersey. The plot came to light when two men gave an 8 mm videotape to a clerk at a nearby Circuit City and asked him to convert it to DVD format. The tape, according to authorities, showed 10 young men shooting at a practice range and shouting in Arabic, "Allahu Akbar" -- "God is great." The clerk alerted local police, who then initiated an investigation into the men, who were living in Philadelphia's southern New Jersey suburbs. In urging greater training and involvement on the part of ordinary citizens, Napolitano noted that 85 percent of the nation's critical infrastructure is privately owned. Since 2003, she pointed out, the Homeland Security Department has handed out over $28 billion in state and local grants to help secure key sites. But the money could have been much better spent, she argued, if the government had received greater cooperation from private sector leaders. Napolitano cited a growing number of threats -- including possible biological, chemical, and cyber attacks -- emanating from multiple sources both at home and abroad. "What this range of threats shows is that while the shock and pain and images of 9/11 stay with us, the terror threat is even more decentralized, networked and adaptive than on 9/11," she said. Turning to the situation overseas, Napolitano said that President Obama has been working to promote a global environment "inhospitable to violent extremism" in part by actively reaching out to the Muslim world. She promised that the Homeland Security Department would continue to match that effort within the United States by building stronger relationships with Arab, Muslim-American and South Asian communities while becoming more "culturally attuned" to issues that these communities often face.